Key Performance Indicators aka: Metrics. Every business has important metrics that need to be closely monitored. KPI Fire provides a simple, visual way to link Goals and Projects to your Metrics. A Visual Management system or Key Performance Indicator Dashboard is an essential tool for tracking progress. There is nothing more important to executives than keeping on top of the company’s activities. Additionally, nothing is more satisfying than seeing that you and your co-workers are reaching your goals. In response to these needs, KPI Fire has created the perfect tool that does both. 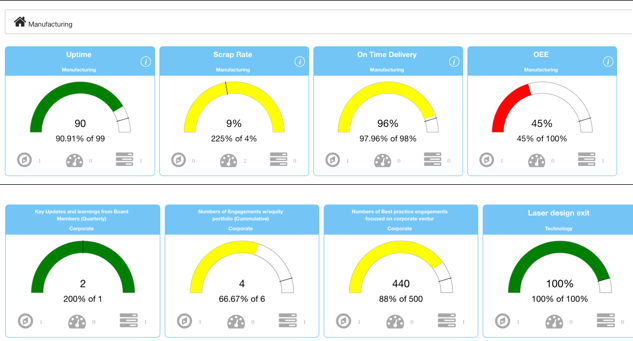 Our KPI Dashboard monitors how your business is performing against the KPIs. Your managers are likely wasting too much time generating plans & spreadsheets when every person generates their own format. KPI Fire simplifies the standard and allows for flexibility. By providing a simple template that anyone can follow for tracking performance against a plan, your organization will simplify the process and save time. Simplifying the standard is one of our main priorities. We want you to be able to see your progress towards your objectives. Many organizations are spending too much time measuring too many things. Focus on the real “KEY” performance indicators to save time and improve results. Creating an executive-level overview that has everything, without cluttering the view, was one of our primary objectives. The KPI Fire Dashboard offers a user friendly interface that allows information to be easily viewed by team members, who will be largely responsible for meeting the KPI metrics. Entering data is easy and the dashboard will reflect the data entered in real-time. KPI Fire is a smart purchase for healthcare administrators, plant managers, and team leaders, who are often responsible for monitoring performance. Given the ability to view key metrics and information, we are confident that you will find KPI Fire a valuable asset for your company. What do you do when one of your Key Performance Indicators is falling out of the target zone? In KPI Fire you receive an alert, and then you initiate a corrective action. These corrective actions can be tracked as projects and can use standard workflows from our library of workflows, or you can create your own. Managing projects and timelines can be a challenge for any company. KPI Fire makes this easier and will help you ensure projects stay on schedule. You will know where your projects stand at any time. You will be able to identify key adjustments that need to be made in order to keep the project on track. Our KPI-focused software, makes you an expert at project management. Contact us today to schedule a free demo and see how KPI Fire can help your company. Which performance metrics should you be tracking?